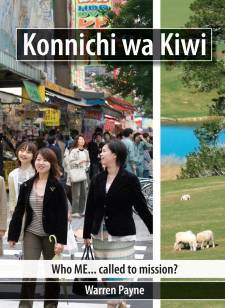 Konnichi wa Kiwi is the unique and fascinating autobiography of an ordinary New Zealander and his family who crossed a vast cultural divide to become Christian workers in Japan. But this book is much more than that - through his story, Warren Payne (National Director of OMF New Zealand) challenges you to discover your own story - to find out what God wants you to do with your life. The story of a typical Kiwi lad following the call of God. As he journeys there are multiple points of contact with readers today. Such readers will hear God at work in their own story as they read Warren's story. This is not some untouchable Hudson Taylor. This is a book to take on a personal retreat for a couple of days. Simple, clear, wise and sane a book that will certainly bless the reader.